Rain is a Jekyll and Hyde condition that can offer excellent fishing or completely dampen your luck by putting the fish down. Fish get accustomed to the steady current flows and surface depressions, and rain can sometimes elevate the activity of fish. Raindrops form a constant visual pattern that’s visible to fish. When insects land on the water or are blown into it, they break this surface pattern. This alerts fish to the presence of food and aggressive strikes are the norm. I can recall one such day on the Deschutes River. For several hours I fished for steelhead under the morning’s warm sun without a strike. However, around noon dark, ominous clouds began to cover the sunlit water. I smelled rain. I quickly donned my rain gear and within minutes a torrential summer rainstorm commenced. I had a strong feeling that this would stir up some action and it did. 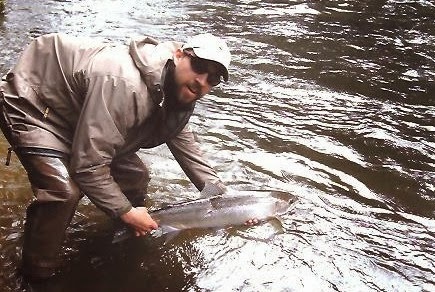 In the next hour, I hooked seven steelhead and landed and released four between six and nine pounds. My luck finally ended when the storm subsided and the sun reappeared. This condition can also occur when you are trout fishing. When wind and rain pelt bushes and overhanging trees, insects can be thrashed and blown out of the foliage and onto the water. This can cause a feeding frenzy. So, rather than heading for shelter when a storm is brewing, put on your parka and brace yourself for action. Foul weather might just bring on warm results.